What is the impact of new supply on the hotel market? 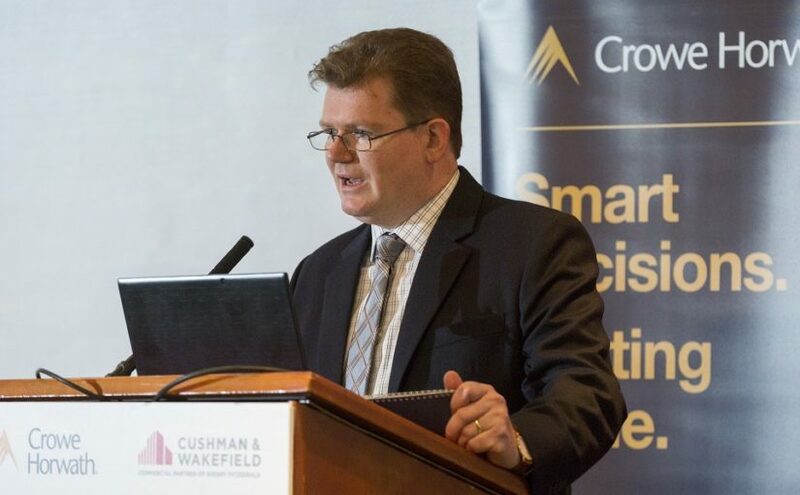 Crowe hosted a Hotel Sector breakfast briefing with Cushman & Wakefield on the Thursday November 9. 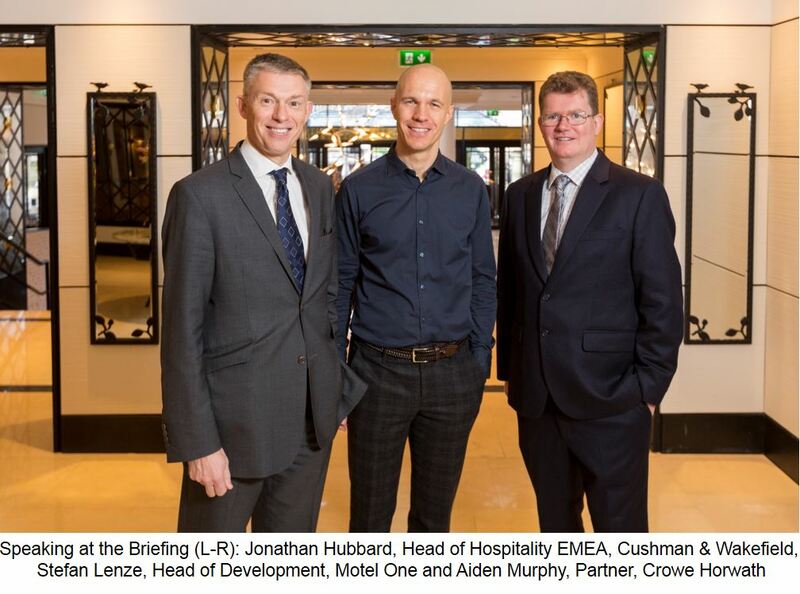 The theme of the event was ‘What is the impact of new supply on the hotel market?’ in which Crowe partner Aiden Murphy explored the impact of new supply on current profit levels within the sector. Aiden Murphy was joined on the panel by Jonathan Hubbard, Head of Hospitality EMEA, Cushman & Wakefield and Stefan Lenze, Head of Development, Motel One. New Dublin supply over next 5 years will need demand to rise by 15% if profit and occupancy levels are to be maintained. Aiden noted that the Dublin hotel sector has seen unprecedented growth over the last five years with average room rates up €47 and occupancy up 12 percentage points both contributing to an average rise in profit per room of €12,000. These strong figures have been fuelled by the shortage of hotel rooms – with virtually no additional supply seen during this period. In 2016, 5.6 million hotel rooms were sold in the Dublin hotel market at 82% occupancy. With an anticipated additional 4,000 hotel rooms over the next five years and for the market to just maintain demand it will have to grow 15% selling an extra 845k rooms by 2021. A key demand factor over the last five years as being the growth in international tourist numbers. For example, figures released in the recent Crowe Annual Hotel Industry Survey show that US visitors hold 17% of the Dublin market accounting for one million rooms in 2016. However, as the growth in US tourists is expected to flatten out, increased demand will need to come from the domestic market. Aiden outlined that city centre hotels face increasing competition as 3,100 of the planned new 4,000 rooms, will be opened in the city centre. Existing city centre hotels will have to react to new competition and implement regular room price strategy to compete within the expanded market and maintain average room rates of €146. Aiden forecasts that increased competition from the new city centre supply is likely to impact the suburban Dublin market as lower room rates entice customers back into the city centre. Jonathan Hubbard from Cusman & Wakefield outlined that 2017 has been a significantly quieter year in term of hotel transactions with only €87.5m worth of transactions occurring across 23 transactions, 60% below Q3 2016, predominately due to the slowdown of receivership and forced sales. The market has returned to a somewhat “normalised” level. Hubbard discussed Investor sentiment which remains high with demand peaking in the main cities, Dublin in particular with demand for approximately 6,500 bedrooms for Dublin City Centre. However, stock coming onto the market remains slow. While there are currently approximately 13,500 bedrooms in the planning pipeline. (New builds + extensions), the vast majority of these (9,194) are speculative, with only approximately 2,500 beds due to be delivered by the end of 2019. Hubbard also commented on the wider EMEA hospitality market that, despite all the uncertainty across EMEA, there remains to be strong investor demand in conjunction with a strong weight of equity. This paired with the growth of institutional demand driven by increase property allocation across EMEA has illustrated the delivery of higher returns for investors. Stefan Lenze, Head of Development in Motel One, highlighted their confidence in the Dublin market as they see potential for building a foothold of up to 2,000 rooms in the capital. Lenze sees further opportunity for branded budget hotels within the Dublin market, recognising that they are filling a gap that currently exists within the sector. Motel One’s pricing strategy, which sees they committing to a definite room price ceiling, is at contrast with the sector’s current model where rooms a yielded to optimise rates at peak demand times. The presentations are available to download below. Please contact a member of our specialist hotel, tourism and leisure team if we can assist with any hospitality or tourism-related project.